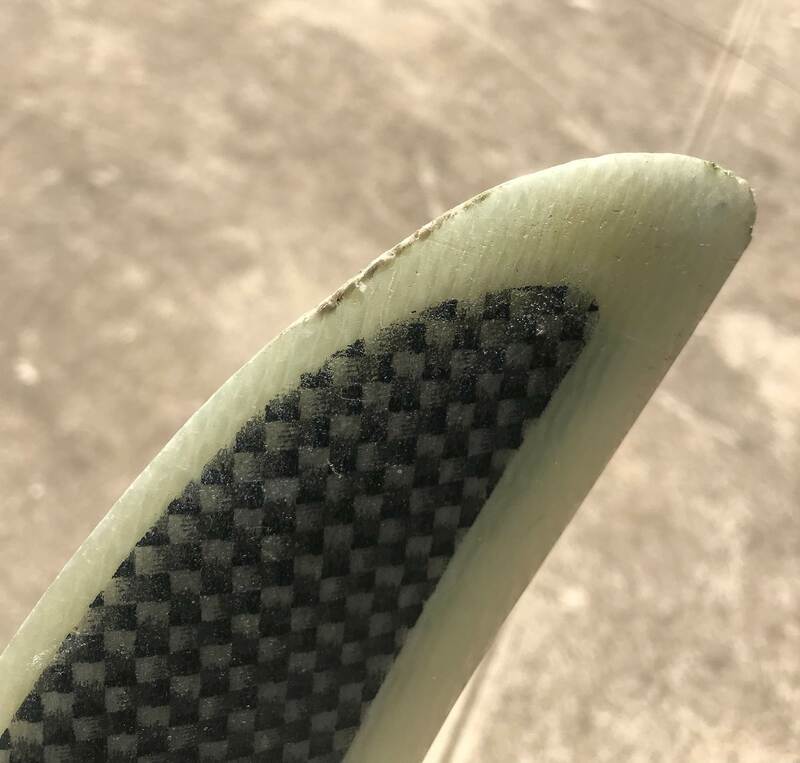 I need some advice on repair/sanding fins - as I haven't done it before. What paper grits should I use? ...in what order? ...Any other tricks/tips I should be aware of? The fin is a Select Ride 46. The tip end is also a bit rough - does it need work or is that ok? 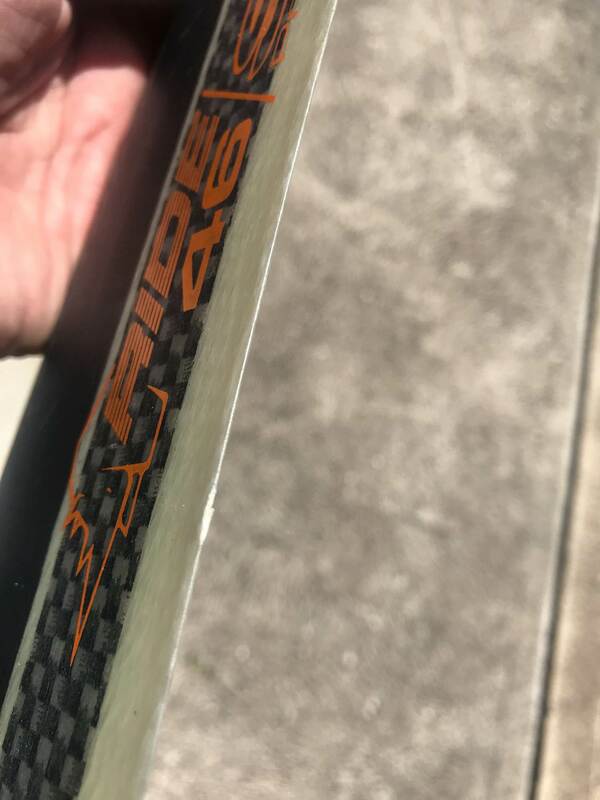 How "sharp" does the leading edge need to be? There is also a tiny knock on the trailing edge. I've noticed some very tiny pitting marks on the surface in some areas - I don't think I sail fast enough/often enough for these to affect performance (cause cavitation) - is it even worth trying to fill these? (...considering they are so small). Considering the amount of wear, I'd just use 400 sandpaper. A bit of bi-component epoxy if you really want to fill the deeper gouges, then file with 400. The leading edge shouldn't be sharp. Bethwaite's "High Performance Sailing"is the only reference I've seen that puts a number on this. P 241 . It suggests a radius of curvature of 1% of chord for slow boats and 0.5 % for 18' skiffs. So at the tip where the chord is about 50mm you'd want 0.25 mm radius of curvature. That's pretty sharp! The wire in a mid-sized bobby pin is 0.5 mm diameter. They all seem to vary. I'd guess it's pretty slow going for even a CNC machine, working in g10, flipping between two sides, to do this accurately so they're all finished off in the factory by a non-sailing person with a piece of sandpaper. Of course you can't get back to the fine factory leading edge radius without serious blending into the existing carefully calculated profile. Here it is! Still in my Seabreeze photo album after all these years! The claimed and retracted first fin to break 50 knots. Struth or friction? We'll never know. ^ It's appalling what 50 kt does to a fin. That's why I make it a point never to go that fast. I would start with 220 or so, I would probably use a sander initially. Then wet paper , and since I have progress to 1000 grit. Wet paper in several grades, some stores offer a variety pack. You will alter the fins shape, esp the tip. I would do them all. Try to not sand into, use the sides to reform. If I didn't like the sanding, some epoxy would help. Ive used a rock before up north does a reasonable job if its to good to waste time going back to the car.A smooth bit of limestone is best. Good luck with using resin I've never had good results. Rocks are but rough but don't use too fine sandpaper, your fin damage is minor, 120 grit finish with 400 grit. Close two fingers around the fin to check foil is correct and symmetrical. Man, some people here are doing to have him sanding for a week - starting with 400 etc geez thats where I'd finish. 120 wet n dry paper on a cork block to get the leading edge curve back nice n smooth, then same to get the leading edge taper. Then 400 wet with fingers. I've never gone past 400 and they feel as smooth as factory. Maybe finer for special speed sailor types...? I'd go even quicker, starting off with an electric sander, rotary or even belt, flat on the leading edge until all that pitted, chipped, and frayed part is off the leading edge, down to solid material, then I'd start to foil (shape) it, maybe even with power to start of with, then down to 400 wet & dry. If you don't get all that damaged leading edge off first, you'll spend a lot of time trying to shape it all away by hand. Not really that much different than shaping a board, you start with a square cut first before you shape the rails, saves time. Do you interchange epoxy with resin ? The exact grit, is kinda optional, can't see that fine is wrong, possible excessive, but feel the fin where it's not damaged, in comparison. 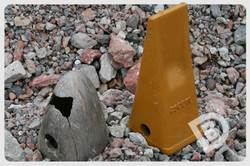 Whack a flappy paddle head on a cordless drill (any grit), neaten it up till its approximately smooth and round, and enjoy the 15 seconds of sailing before the fin hits more lakebed shells, rocks and cr@p and returns to its natural, munted form. 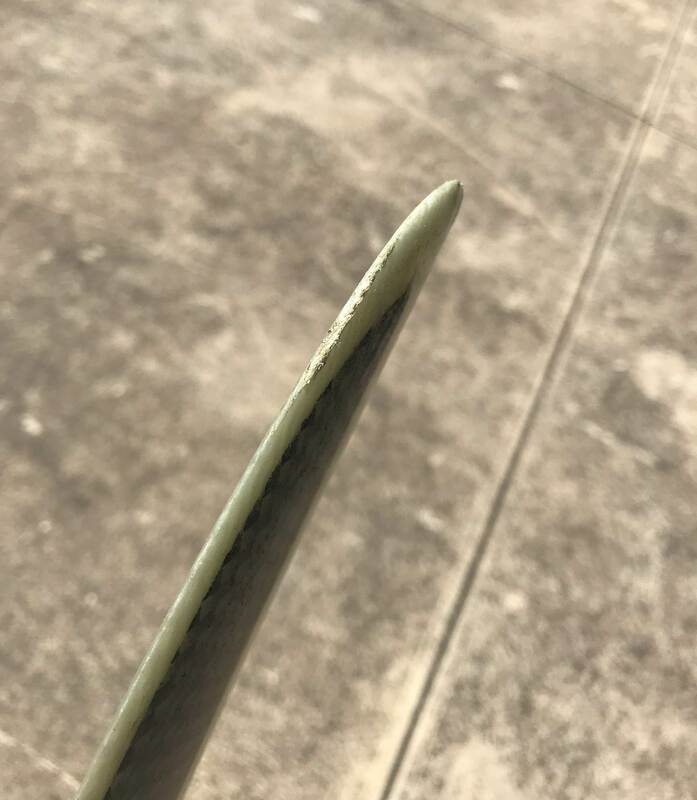 More seriously, effort to shape and smooth fin with multiple grades of sandpaper should be inversely proportional to the likelihood of the fin staying in that condition. Where we sail, fin strikes on the lakebed are a regular occurrence and if we ground out every dint, every time, we'd have no time for sailing, and no fin to sail with rather quickly. I've been known to do that to storm water pipes and rough cut timbers - but at least you're improving on Foghorn's "smooth bit of limestone"
Thanks for all the feedback guys.As usual ...varying, entertaining, and... useful. enjoy the 15 seconds of sailing before the fin hits more lakebed shells, rocks and cr@p and returns to its natural, munted form. Good observation eckas. Often in physics the natural munted form is the line of least resistance. Your problem Eckas is the lumpy rocks and shells in Lake Illawarra. If it was pure 1200 grit sand your fins would possibly maintain perfect hydrodynamics as they wore. ( I'll emphasise possibly, there's a phd for someone in this). There's always shells and stuff on the seafloor but windblown sand is pretty well filtered. You could find a sandy track behind a beach dune and mount the fin on your tow bar for a couple of km. 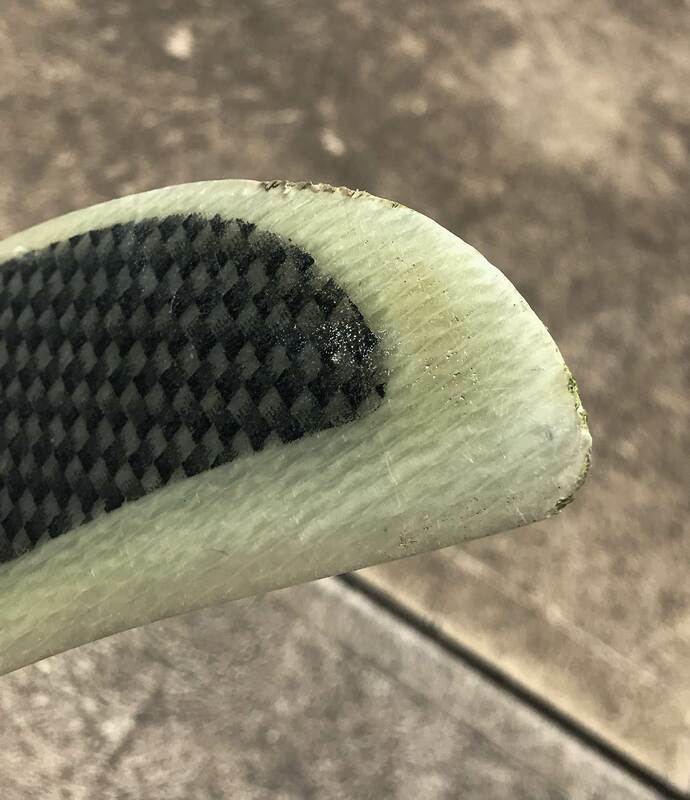 Fin manufacturers might be able to get away from the random hand-sanded leading edge by running the roughly machined fin through a slurry a couple of times. Exactly what I'd do too, except I wouldn't use the block, just pinch the paper around to the natural curve of the leading edge. I find that Canadian wet paper, works best.Followded by Polish, and Canary Island. China stuff is crap. Also the ones that are 12x12 inches only are effective a short period.